The aftermath of the recent political dysfunction in Washington orchestrated by Texas junior Senator Ted Cruz is reverberating across the shores of United States as Nigerians pile on the Republican senator for comments largely viewed as disparaging of that country's reputation. In a statement in Washington, Nigeria's top diplomat in the United States, Professor Ade Adefuye demanded an apology from Senator Cruz for making a reference to what he called “Nigerian email scammers” during a critic of the technical glitches that followed the roll out of America's Affordable Care Act. “For a start we are shocked that a high profile Senator of a country which is at the forefront in building a peaceful and stable world in which nations and peoples treat each other with mutual respect could be engaged in an act which offends the sensitivities of an important component of his constituency”, Ambassador Adefuye stated. The statement couched in diplomatic speaks noted what it termed “the constructive contributions which Nigerians have made to economic, social and political lives of Texas especially in the Houston area” pointing out that while every country has its own share of law breakers to use the activities of few as an opportunity to cast aspersions on the integrity of a country and its people is not only unfair but also excessively offensive. Whereas it is not the practice of any Nigerian diplomatic mission to interfere in the domestic affairs of our host countries, the Ambassador maintained that the country would not sit back, fold her arms while a “politician assaults the integrity of our country and people in the process of appeasing the base instincts of a few misguided elements in his constituency”. 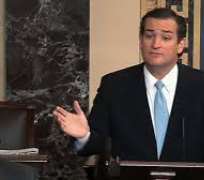 Senator Cruz's comments have also been criticized by Continental African Leadership Council and the Nigerian-American Leadership Council. In an interview with The CMPI Journal, Executive Director of Continental African Leadership Council and member Advisory Board of Maryland Nigeria Sister State Program, Dr. Sylvester Okere condemned what he termed intemperate remarks of the junior senator who has no knowledge about Nigerian people. Dr. Okere was of the view that Senator Cruz's disparaging remarks confirmed a larger narrative of contempt for black people especially Africans in the United States. He cited the historic Bernie Maddoff scandal pointing out that no Nigerian government or African government insulted the people of United States for the scam of the century otherwise called the ponzi scheme. “It is certainly insensitive,” he said. For a senator who perhaps has some medium-term plans for being in the public for a long period of time, Mbonu concluded that those kinds of comments should be well thought out.